Well with the move and everything I may have totally forgotten my June WIPocalypse post and it's almost time for the July one! 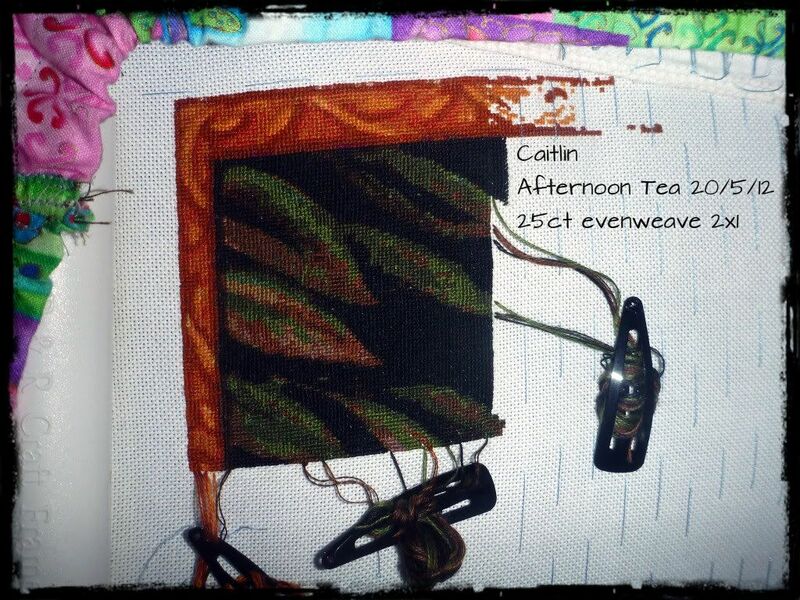 I have been busy just not really stitching on my big projects much because I don't have the time to sit much. For afternoon tea you've already seen this photo but I may as well show you again :D it's so pretty with one page finished! Now please excuse the really bad photos it's pouring down rain here and it's hard to get decent light. 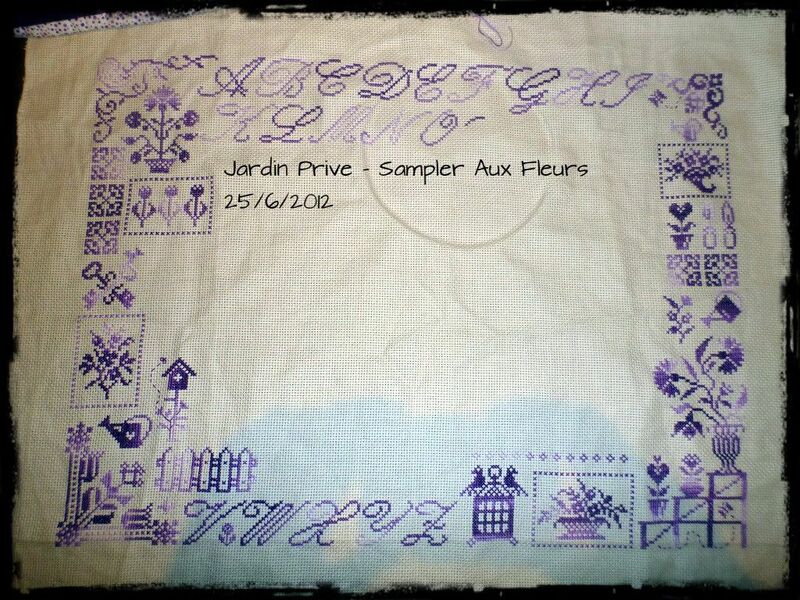 I have worked on Jardin Prive. Not much as I have been trying to work on Geisha Girl and another project which I will tell you about tomorrow! You can see the shadow of my hands at the bottom ... as I said really bad picture but you get the idea. I noticed something though when I was reading the letters in the alphabet. They have missed out a letter. Can anyone guess which one? 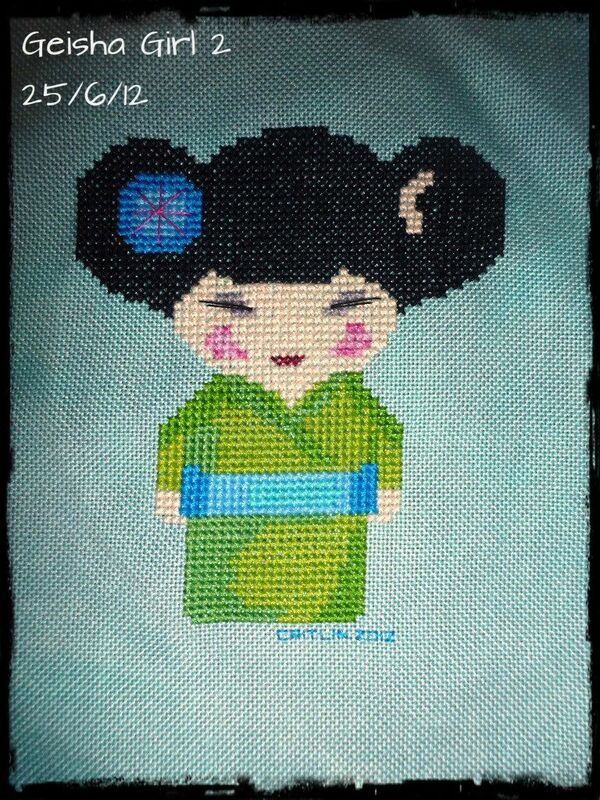 On an exciting note I have FINISHED Geisha Girl! I am soooo happy about this piece. Working on evenweave which I love working on and it was much easier than the small girl I think the bigger count helps! and the evenweave not linen. I really don't like linen much! I am going to finish this one into a needle book as I have nothing to keep my needles in. I really need to find some decent quality wool felt. So those are the main projects that I have been working on and I have one more little finish to show you tomorrow. All of the projects looks great. :) It looks like you have managed to do quite a bit even with being so busy and stuff. Good luck on finishing with the move. Whoops. Is it J? Great progress! I think the H is missing! The Geisha girl looks adorable!! Looking good Caitlin. I love your little Geisha girl. She's darling. And for some reason I can't remember atm, they often leave off the letters J and U from samplers. I wish I could remember the reason, but I sure can't. Lookin' good and making great progress!